It's time for another round of The Sage Glow Quiz! If you missed the last two, you can check them out here and here. 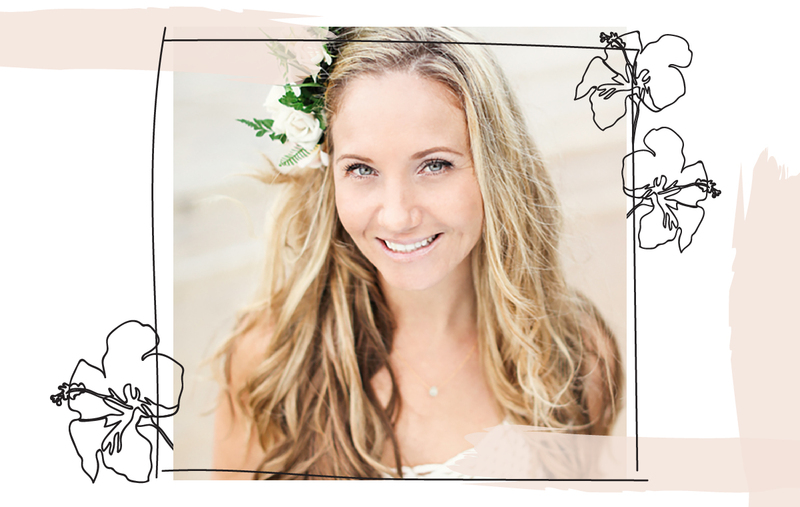 This month I am thrilled to introduce you to Leah, the founder and mermaid-in-chief at Leahlani Skincare. Leah and the lovely ladies on her team graciously sent me a box all the way from Hawaii, full of the most delicious, 100% natural skincare goodies that I have been cherishing and loving. Having fallen in love with the brand, I knew I wanted to include Leah in this series to learn more about her. Read on for her island inspired tips and tricks. What do you do? I am a holistic skincare expert, dually licensed esthetician and full-time botanical alchemist at Leahlani Skincare. What’s the first thing you do when you wake up? Deep breaths, snuggle my kitten and my husband, and then make a fresh pot of coffee to drink on the lanai while listening to the birds sing. What’s your morning ritual? My morning ritual always consists of masking with Meli GLOW, snuggling my kitten, and drinking coffee while catching up on my mountain of emails. I really dislike rushing into the day, I love easing into each day slowly. What’s your bedtime ritual? A steamy shower, a nice cup of tea, followed by a facial massage with Mahina Elixir and Bless Beauty Balm. Workout of choice: Intense cardio or anything that will make me drip in sweat. Talk beauty products: what are your daily go-to’s? Morning is always masking with Meli GLOW, followed by Citrus and Citrine Toning Mist. While my skin is still damp, I spend a good 1-2 mins massaging Aloha Ambrosia Elixir into my skin. Mornings are not complete without this ritual. Evenings are double cleansing with Pamplemousse followed with Kalima Cleansing Powder. Every night, I do a facial massage while laying in bed with Mahina Elixir followed by Bless Beauty Balm. I live for my skincare rituals! Signature uniform: In the studio: Yoga pants, comfy cotton shirt, pink crocks and an apron. Outside the studio: I am all about comfortable clothes. I love flowy and breathable fabrics and jean shorts, and you will almost always find me in open toed sandals. No-fail smoothie combo: Frozen mango, fresh ginger, plain yogurt, coconut milk and honey. I live for this! 5 things always in your pantry: Coffee, honey, coconut oil, red wine and kitty food. Favorite snack: Rice cakes with almond butter drizzled with raw honey (OR) rice cakes with avocado, sprinkled with sea salt and pepper and sesame seeds. Favorite local restaurant: The Dolphin for sushi, Palate for wine, breakfast at the St. Regis for the view, and tapas at Ama or Baracuuda. Beach or mountains? Beach. But luckily I live on Kauai and we have the best of both. Favorite place in the world: Kauai and my hometown, Seal Beach, CA. Usually on your Spotify: Music is my go-to when I need to change my mood, so my station is really varied. You will find 90’s rap, hip hop, meditation, French music, electronic music and jazz. Favorite blogs or websites: I love the blog A Beautiful Mess, and I love browsing Target and Urban Outfitters or Anthropolgie websites for decorating inspiration. Favorite indulgence: A nice glass of wine or champagne with my best girls, and lots and lots of laughter. Weirdest beauty or health trick: I use my conditioner to shave with (life changing!). Who or what inspires you? I am visually and sensorial inspired, and I happen to live in one of the most beautiful places on the planet that constantly fills me with inspiration. I am inspired by mother nature’s color palate, the scent of tropical rainfall, flowers and sea breezes, the textures of raw earth and the magical alchemy of bringing all of these elements together to create the most beautiful beauty products that I can. I am also inspired by connection of the heart. How do you spread love in your world? We place a sticker on the back of each product that reads ‘From my loving hands to yours’. There is an abundance of love and aloha infused into each batch of products I make, and my hope is that when people receive their aloha box of Leahlani treasures, they can feel that love with every application.